From my beloved aunt Sylvia’s journals, which include entries on her role in the Auxiliary Fire Service (AFS) in London in World War II. I can’t help but think that this diary will be a very interesting document one day – my account of the Blitzes are interesting even now! I hope if I’m deaded someone will find it & treat it with proper respect. 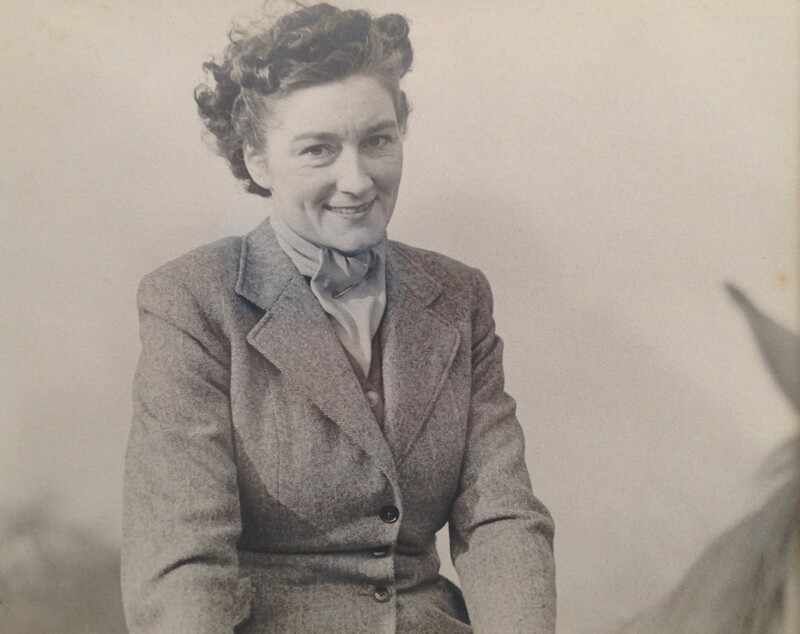 I have just seen Lance [Sylvia married Lance Elliott Barker, a solicitor who also served in the AFS during the war, on 17 July 1937] off into the wet & windy darkness, sending my heart with him, home to our lonely house (Ruth’s flat now). Life is too full of ‘claspt hands & eternal farewells’ – well – not eternal but always farewells – I know I’m lucky to have him by me at all really. The Blitz came back to London last night. There seemed a lot of them coming over, a nasty sound, & the crump of bombs near & far. Then the most devastating whirling scream, it seemed to be twisting & turning nearer & nearer – for what seemed ages, and my heart clamoured, but there was no sickening thud & Jeffs said it was one of the new ‘Candelabra flares’ – anyway the place was lit up like day. Afterwards my legs started their odious shaking, luckily invisible beneath my baggy pants & soon went, then we got too busy to worry much, the fire watchers did their stuff & tho a lot of incendiaries fell, very few fires developed at all. Jeffs came back with the news that there were two D.A.s & an unexploded land mine only a stone throw from Bucky Palace & later we heard a bomb had gone right into the Café de Paris with horrible results. I knew Lance was at 8 [his fire station] (he’s got 3 months furlough owing to Knight’s illness) but was doing a night at the station yesterday, actually riding the red pump. He didn’t go out at all till 4 a.m. though quite a lot were dropped, then they had quite a job in Prince’s Gate –the All Clear sounded just after midnight & so to bed. We had nothing like the fires but there was enough H.E. [High Explosive – bombs] to make it pretty loathsome & scattered fairly widespreadly. I do not relish the thought of the Blitz starting again. This lull has been so divine – it’s all very well to pretend one’s not afraid, but if it got really bad again there’s always the awful feeling that one might crack – damn – here are the sirens. I’d hoped the rain would keep the bastards off. It’s useless to pretend one does anything but loathe their odious keening – maybe it’s only a spotter; let’s hope. 13th Not a spotter, they droned over all evening but no bombs. Another ghastly Blitz last Saturday Night (the 11th). [part of this has been cut but will be reinstated in September 2018] The damage was colossal in Westminster but Holborn was frightful (Lance’s new office’s roof burnt through & water everywhere) but I believe the City is ghastly – the one cheering thing being that they brought down 33…. The Abbey was saved, only part of the roof, Parliament is a bad mess as it had 8 H.E. – many more Westminster churches are gone. I expect the death toll will be over a thousand. There were the usual grisly heaps of ruins all over ill-starred Pimlico.